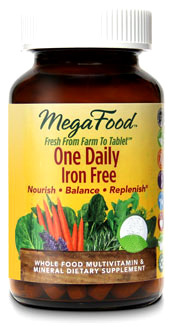 One Daily Multivitamins - Iron Free, 30 tablets (Mega Food) - Penn Herb Co. Ltd.
One Daily is an herb-free formula available without iron, and is suitable for the entire family. Each tablet delivers a full spectrum of carotenoids and age-defying antioxidants from fresh colorful whole foods for optimal antioxidant protection plus mindful potencies of essential vitamins and minerals to promote energy levels, immune health and overall well-being. One-a-day, iron-free, herb free foodstate vitamin & mineral formula. Enriched with enzymes to enhance digestive health. It’s gentle on the stomach and can be taken anytime of the day, even on an empty stomach, and will not cause upset.